The role of the lighting designer is a complex one, straddling both art and technology. Pictured, one of lighting designer and expert Rob Sayer's many lighting designs from the past two decades in the industry. Image courtesy of Rob Sayer. The lighting designer's role in the production team encompasses a fascinating combination of art and technology. The lighting designer doesn't just light the stage, but instead creates an overall wash of colors, effects and illuminations that not only shape the emotions of the audience, but can have a rich and complex influence on a scene and its subtext. 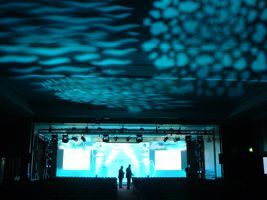 The lighting designer's design for a show incorporates everything from light colors to lighting instrument types, placement, and changes (or cues) from scene to scene and moment to moment. While the costume designer, set designer, and hair/makeup designers must often work within specific styles or periods, the lighting designer's art is often the most free and abstract. The lighting designer's brush is light, and his paint is color. Choosing the hue, placement, direction, intensity of that color and how it washes across the stage, the lighting designer can create time and place (night or day), mood (romance or terror), and more. In creating and implementing a final overall lighting design, light plot and cue sheet for a production, the lighting designer will work closely with the director, and may also conference with the set and costume designers to understand how the lighting effects he creates will affect the costumes and sets onstage. 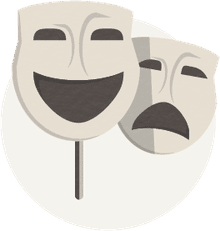 The lighting designer will also work on a close and practical level with the stage manager, especially in fine-tuning and preparing cues throughout the tech rehearsal process before performance, as well as with the grips or electricians on the crew for the positioning and focusing of the lights. The lighting designer will also work with the sound or effects designers and technicians who will be preparing simultaneous cues and running sound effects for performance as well. In many smaller productions, the lighting designer may also be the lighting tech, or the person who runs the light board itself during performance. The lighting designer’s toolbox includes a rich variety of items, from the drafting supplies, pencils, gel swatchbooks and more that she may use in creating a rough-draft light plot, to lighting templates or field templates to integrate specific lights and spotlights into the lighting design, to such software as Capture, WYSIWYG Perform, Vectorworks Spotlight, or MacLux Pro for higher-end computer lighting design that will help in visualizing those transitions. Lighting designers must also be proficient at working with lamps and spots, gels, gobos, and other accessories and rigging, as well as in working the actual light board itself from within the venue’s control booth. Lighting designers must be at ease with several different types of charts and forms, as they will not only create light plots and cue sheets as they prepare the lighting for a show, but must also create instrument schedules and focus charts in many cases as well. A list of the industry's most famous lighting designers (including a wealth of Tony winners and nominees) would include such notables Jules Fisher, Tharon Musser, Jo Mielziner, Andy Phillips, Ian Calderon, Andrew Bridge, Jennifer Tipton, Rob Sayer, Scott Warner, Cosmo Wilson, Hugh Vanstone, Paule Constable, Peter Barnes, Mark Howett, Chris Parry, Billy Name, David Hersey, Marcia Madeira, Natasha Katz, Nigel Levings, and many more. To learn more about the role and challenges of the lighting designer's work, check out my interview with acclaimed lighting designer and industry expert Rob Sayer.